Clients who need investment advice or who want to engage in a securities transaction will seek help from a securities agent and investment adviser representative. The most qualified professionals have taken the North American Securities Administrators Association’s Uniform Combined State Law Examination. The test, commonly called the Series 66 exam, is administered by the Financial Industry Regulatory Authority. The exam grills applicants on a wide range of financial questions. Here’s what you can expect on the test. How many questions are on the Series 66 exam? There are 110 multiple-choice questions on the test. Of those, 100 are scored, and 10 are not. Candidates must correctly answer 73 out of 100 questions to receive a passing grade. Candidates have 150 minutes to complete the Series 66 exam. The test fee is $165. 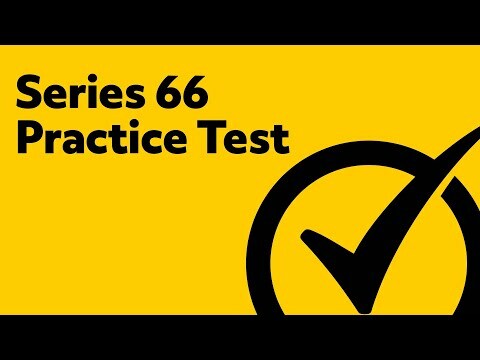 What’s on the Series 66 exam test? There are four categories of questions on the test. Economic Factors and Business Information contains five questions that focus on methods of analytics, including money concepts like internal rate of return; statistics such as mean and median; and financial ratios such as current, quick and debt-to-equity. Special accounts, ownership, and estate planning, securities trading and performance measures for portfolios. Laws, Regulations, and Guidelines Including Prohibition on Unethical Business Practices is the largest area of the test, with 45 questions. Ethics and fiduciary obligations cover compensation such as fees and conflicts of interest. Candidates receive their score as soon as they finish the exam. The Financial Industry Regulatory Authority has hired an independent testing organization with testing centers across the country to administer the exam. What are the policies at the test center? Candidates should get to the test center early on test day. Any candidate who arrives at the center more than 15 minutes late won’t be allowed to take the exam. What identification do I need on test day? You’ll need a government-issued ID that has your photo and signature. Can I bring personal items like a mobile phone into the test room? No. No personal items of any kind, including electronic devices and certain items of clothing, are allowed in the testing room. All personal items must be placed in a test center locker. What if I need writing materials and a calculator for the test? Candidates will receive, at the testing center, a whiteboard/dry eraser and a basic calculator. I’ve always dreamed of this career. What preparation materials should I buy? Mometrix has test preparation materials that will help get ready for this important test. 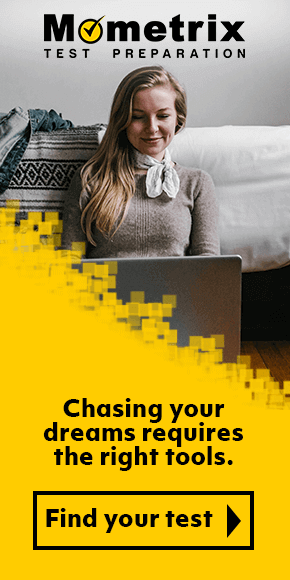 Our easy step-by-step study guide will show you how to solve exam problems, provide a study plan for the test and guidance on how to beat the number one enemy of some test takers — procrastination. Our flashcards are great to use at any time and any place because they’re portable. Even if you have just a few minutes, you can pull out a flashcard and quickly study test areas that are proving difficult. These are two excellent tools to help you prepare for the Series 66 exam. 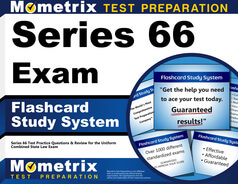 Mometrix Academy is a completely free Series 66 test resource provided by Mometrix Test Preparation. 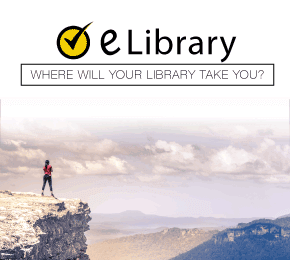 If you find benefit from our efforts here, check out our premium quality Series 66 Study Guide and Series 66 Flash Cards to take your studying to the next level. 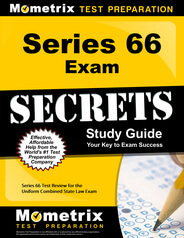 Just click the Series 66 study guide link below. Your purchase also helps us make even more great, free test content for test-takers.